The following special DHL shipping service is ONLY FOR CUSTOMERS FROM GERMANY ! For all customers from Germany we are offering an extra discreet shipping service from DHL called " Packstation " ( pick-up station ). - you are expecting very private parcels ? - you are often not home when your parcels arrive ? Then we have the perfect shipping solution for you. 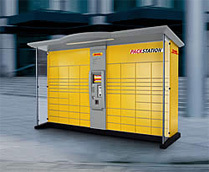 delivery to around 1,000 parcel machines across GermanyFREE registration and use! Register now for free and have your future parcels delivered to any PACKSTATION you choose. You can find your closest " Packstation " at " Packstationfinder ".